The Orchard Center is located at 2245 Sequoia Drive in Aurora, near the interchange of I-88 and Orchard Road. Classrooms, study areas, and administrative and faculty offices are located on the third floor of the building. Q. 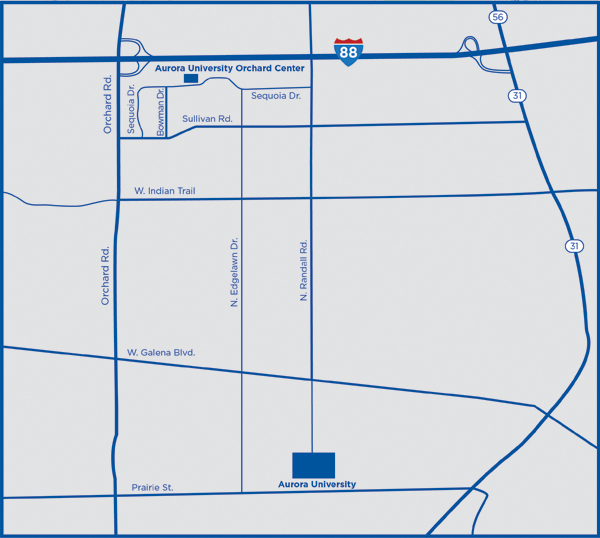 Where exactly are Aurora University classes held at the Orchard Center? A. The Orchard Center is located at 2245 Sequoia Drive in Aurora, near the interchange of I-88 and Orchard Road, approximately five miles from the main campus. Classes are held on the third floor of the Orchard Center. When you enter the building, proceed from the lobby to the first floor elevators on your left. Take the elevator to the third floor. The Aurora University classrooms and offices are immediately to the right after you exit the elevator. You may also access the third floor via the stairwell located in the rear of the first floor lobby. To locate your specific classroom, please go to WebAdvisor and check under the "meeting information" section. If your class is scheduled for the Orchard Center, it will be listed as ORCH. Q. Are faculty and administrative offices located at the Orchard Center? A. Yes, select faculty and administration, including the staff of the Center for Graduate Studies, have offices on the third floor. Q. Do I have to pay for parking at the Orchard Center? A. No, parking is free and conveniently located near the entrance of the Orchard Center. You are required to have a free university parking sticker. The AU Orchard Center parking sticker is the same sticker used on the Aurora University main campus. Q. I do not have a car. How will I get to the Orchard Center? A. A limited shuttle service is available by reservation from the main campus. Contact Joyce Kailius, jkailus@aurora.edu, if you are taking classes at both the Orchard Center and the main campus and need transportation assistance. Q. Is there a student lounge and computer lab at the Orchard Center? A. Yes, there is a student lounge with vending machines, a student lounge with light food options and a computer lab with printing capabilities on the third floor of the Orchard Center. Laptop check out also is available for use at the Orchard Center. Q. Are student resources, such as Financial Aid, Student Accounts and the Registrar, available at the Orchard Center? A. Yes, these services are also on the third floor of the Orchard Center.